Well, it’s that time of the week again. Actually, it’s a day late, but whatever. This week, for the Book of Doom, we decided on the first issue of the new miniseries “Legion of Three Worlds,” a tie-in to “Final Crisis.” Written by Geoff Johns, drawn by George Perez, it focuses on Superman and the Legion of Superheroes of the 31st Century versus Superboy-Prime and the Legion of Supervillains. So, what’d we think? I’ll let the other guys flesh out the major points, and I’ll follow up at the end with my general reaction. Here we go! Fin Fang Doom: So I think the question swirling in everyone’s mind after reading Legion of 3 Worlds is “What does this have to do with Final Crisis?” There’s no Evil Gods, no Japanese teen superheroes, no Monitors, no dogs/horses. Just Superman, the Legion, and the return of the totally-awesome-as-written-by-Geoff-Johns Superboy-Prime. So what does this have to do with Final Crisis? Hopefully nothing. Legion of 3 Worlds continues directly from the Legion story told recently in Action Comics, involving the Silver Age Legion that was brought back by Geoff Johns and Brad Meltzer in the terrible Lightning Saga JLA/JSA crossover a couple of years back. Don’t worry, things have gotten significantly better since that storyline. Superboy-Prime wants to prove he’s one of Superman’s greatest enemies, and he’s going to use the Legion of Super-Villains to do it. Superman wants to try to bring back the goodness there once was in Superboy-Prime, and he’s going to use the Legions from three different universes to do it. And all the while there’s this creepy guy in a purple robe that’s pulling everyone’s strings. I’ve got to say that I got a little bit of goose bumps when Superman said he didn’t want to beat Superboy-Prime, he wanted to redeem him. 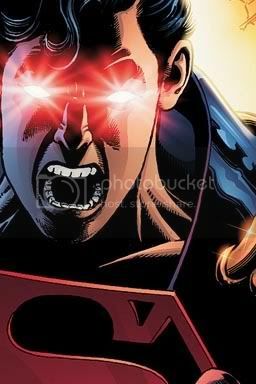 DC (and Geoff Johns in particular) has done such a good job of turning Superboy-Prime into a vile, disgusting, evil creature that I had completely forgotten about how he used to be. Superboy helped save the entire multiverse twenty years ago. He was a hero until he spent twenty years trapped in a bubble with Alexander Luthor. And of course Superman would never forget that, or stop hoping that Superbopy-Prime could be helped. I could really take or leave all the business with The Legion possibly being disbanded, though. It seems like every time I read the Legion (which as I said, isn’t very often), the team is on the verge of being shut down by the United Planets. And I didn’t even know this mustachioed shape-shifter existed before this issue, so I couldn’t care less that he’s been shot. I’m not reading this series because I want a bunch of history on the Legion. I’m reading it because I want to see Superman take on Superboy-Prime one last time. Considering the creative team involved, I’m not surprised that I liked this issue. It does strike me as a little bit odd, though, that a lot of these Final Crisis tie-ins are turning out a lot better than Final Crisis itself. FC: Requiem, Rogue’s Revenge and now Legion of 3 Worlds have all been good (or at least seem like they will be good) despite their connection to DC’s Big Summer Crossover. Looks like DC might be taking a page out of Marvel’s playbook for this one. That said, I like how Legion of 3 Worlds is starting. It looks like Superboy Prime and the Legion of Super-Villains will battle Superman with the help of the “Lightning Saga” version of the pre-Crisis Legion, the post Zero Hour Legion, and the post Infinite Crisis Legion. Superboy is apparently drawn into action because he’s pissed that he doesn’t have a more prominent place in the Superman history museum. It’s kind of funny, but let’s be honest — it’s a little disingenuous to ignore Superboy Prime’s role in Infinite Crisis and the Sinestro War. He did kill thousands of people, including Superman-2 and Superboy Luthor. It also appears as if the future, much like Grant Morrison, never read Countdown, so everything Superboy did there (including grow up, change clothes and grow a mullet) never happened. Fair enough. I think I would also program the museum tour guide to not give a potential villain all the information he needs to start a war against humanity, but that’s just me. The moves to put all the pieces in the place felt a little “cart before the horse” — it’s like they said “Hey, let’s have Superboy and the Legion of Super Villains fight three Legions of Super Heroes … how can we make that happen?” rather than letting this unfold naturally, but that’s a tiny annoyance that I’m sure will be completely erased if this ends up being a good story. It appears now as if it’s almost a hobby of Geoff Johns to take seemingly contradictory continuity and make something fun out of it. In spite of the fact DC rebooted the Legion again for Infinite Crisis, Johns has made it clear for a few years now that he wants the pre-Crisis Legion back. I assumed this was going to result in the current Legion just fading away in favor of a more preferred post-Infinite Crisis Legion continuity, blaming it on the return of the Multiverse. While that may still happen, I like that the current Legion is presented as an alternate-reality equal to the original Legion, and so is the SW6 version, who I assumed were also victims of Infinite Crisis after their brief appearance in Teen Titans a few years ago. It looks instead like Johns was just laying groundwork for this already in 2004 with little pieces dropped in his various titles since. I think my favorite thing about this issue is that Johns has basically told us the ending — by issue 5, Superboy Prime will be redeemed. We know how it’s going to end, and the fun is going to be watching how he does it and what that actually means for the characters involved. Giving Superman the answer to The Superboy Problem is one of those things that Johns does so well — capturing the essence of a character in a moment that’s both tiny and huge. It may have been relegated to a side-series, but Superman saying “We need to redeem Superboy Prime” is right up there with “The last time you really inspired anyone was when you were dead” for me in terms of one-liners that encapsulate a major character’s personality. I’ve heard the current Legion series is getting cancelled soon, and the Teen Titans crossover seemed to end the ’90s Legion continuity. The fact that the Lightning Saga Legion has already gone through the Legion of Three Worlds battle and survived it makes me assume there will be some Legions and future realities biting the dust. If the pre-Crisis favoritism continues, I just hope those other Legions get to die well. Doom DeLuise: I liked it. How it fits in with Final Crisis, I’m with the rest of the crew. I haven’t an idea. In Final Crisis, Superman is at Lois’ bedside, as Clark Kent, keeping her alive by warming her heart with his heat vision; yet, one of the Monitors shows up and says he has to come with her or Lois will die, so he presumably goes. Then, in this thing, he’s flying around, is stopped by Braniac and asked to come to the 31st Century? Ok. Is he just operating under the assumption that he’ll eventually be back, at that exact starting point, after his 31st Century adventure is over, ala Back to the Future? Does he just need to work off some steam by beating up bad guys in the future so as to get his mind off his dying wife in the present day? It just doesn’t fit in, and I figure the only reason it has Final Crisis plastered on its cover is to attract more buys and not outshine the main series, which sort of happened last year when Sinestro Corps War outshined everything else DC was running at the time, which screwed up their Countdown scheduling. As for the rest of it, yeah, way more entertaining than Final Crisis, with a helluva lot more going on. I also like it how Superboy-Prime is signed off as a nobody by the Superman Museum, yet the Legion of Super-Villains guys are all like, “We knew you’d come for us and unite us” or whatever they said. Seems he’s a bit more important than the museum wanted people to think. I was very entertained, and I’m looking forward to seeing where they take this thing. Great set-up issue, though. Now if they’d just drop the boring xenophobia undercurrent and just focus on good guys fighting bad guys. Also, how is it that George Perez can draw every single superhero and supervillain from, like, six different groups of characters, in just about every panel, and still meet his deadlines? Is he just a freak of nature, or are the other artists out there a bunch of wimps? Great points on the accessibility, FFD.